Here are some tricks for navigating and gluten-freeing your Thanksgiving table. Between the stuffing, pumpkin pies and bread crumb–topped creamy casseroles, Thanksgiving is probably among the least gluten-free friendly holidays out there. But luckily, with all the great fall produce ready to be whipped up into thanks–inducing comfort food, the wheat-free set won’t be left with just double helpings of gravy-less turkey. 1. Beware of turkey brines. The bird is the least of your gluten-free worries, so long as you keep things simple and avoid any brines, marinades or glazes that might have wheat in them (like beer or soy). Skip the stuffing and pack the cavity with a whole lemon and herbs. A good layer of compound butter under the skin will make for crispy skin and moist white meat underneath. 2. Thicken gravy with rice flour. This is where wheat usually comes into play. Instead of thickening gravy with all-purpose flour, whisk an equal amount of white rice flour into your pan drippings. This is also my favorite type of flour to use for béchamels at the base of Thanksgiving casseroles (see below). You can easily swap in gluten-free bread in any standard stuffing recipe. Make sure to toast it well before tossing with the vegetables and liquid, as wheat-free breads tend to be less sturdy and more prone to sogginess than they type you’d use from a regular bakery. Alternatively, you can make your own gluten-free corn bread and use it in this version with country sausage or this recipe with wild rice. 4. Bring on the potatoes. Mashed potatoes are an easy naturally gluten-free side to add to the mix. This semi-sweet potato gratin (using half russet potatoes, half yams) with shallots and Gruyère is one of my favorites. 5. Use cornstarch or healthy-creamy yogurt to thicken casseroles. Casseroles that use packaged creamed soups or béchamel as thickeners are a no-no for your gluten-free Thanksgiving table. 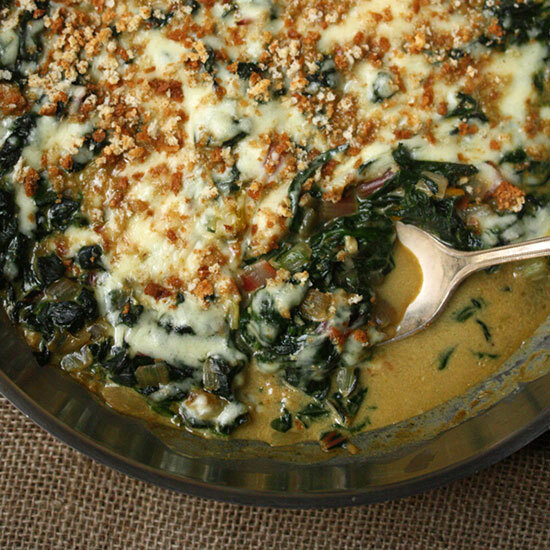 In addition to substituting rice flour, as recommended above, you can also choose a recipe that uses cornstarch to create body, like this winter greens casserole. Other recipes, such as this cauliflower casserole, get creative with healthy additions like yogurt to provide creaminess and texture. Just make sure to replace any bread crumb topping with a gluten-free version. Ground tortillas and corn chips make for a great crunchy finish. Keeping all of the additional dishes on the table seasonal and vegetable-centric is a great way to ensure that there are plenty of naturally gluten-free options to be had. Roasted brussels sprouts with radicchio and bacon vinaigrette is a great warm-and-comforting salad, while creamy pumpkin soup and mashed turnips with miso butter are simple ways to let the best farmers’ market produce shine. 7. Don’t skip the pie. Substitute a simple almond flour crust for your favorite pie and tart recipes, or use a combination of ground nuts or gluten-free cookies and butter to create a crumbly press-in version. Most fruit fillings are naturally gluten-free, just opt for recipes that use cornstarch instead of flour for thickening.